Widely considered one of Ousmane Sembene’s best films, Xala satirizes the corruption of the post-colonial politicians and businessmen tasked with running Senegal following the nation’s independence from France. Like his first film, Black Girl, Sembene points out the obvious (though invisible) shackles of colonial history in his country (and by extrapolation, Africa as a whole), but this time lampoons the aftereffects of cultural subjugation rather than utilizing more straightforward, depressing criticism as in Black Girl. It’s a less haunting but far more entertaining and effective criticism than Sembene’s first film. Senegalese political and economic leaders open their briefcases to see what their former colonial masters have left them to ensure their continued cooperation. Xala points out that Senegal’s homegrown political and economic leaders were little better than the country’s former foreign imperialists. Our misguided and morally reprehensible protagonist, a politically influential Senegalese businessman played by Thierno Leye, plays to the worst sides of both his own conservative Muslim African culture and that of post-colonial, culturally parasitic France. He takes multiple wives, beats his children, and brags about his patriotism and financial superiority to others while supporting French commerce through his local business, taking bribes, and corrupting native leaders through his ties to European powers. Sembene doesn’t make light on local conservative religion (at least not to my tastes upon viewing the polygamy scenes), but most of his criticism centers on the idea that capitalist corruption and political impotence are legacies of European colonialism. Leye’s character finds himself cursed with a symbolic disorder of impotence — a sexual disability spell cast upon him by unknown enemies meant to represent the feminized, emasculated, and ineffective cultural leaders of Senegal corrupted by colonial influence well after actual French colonialism ended. 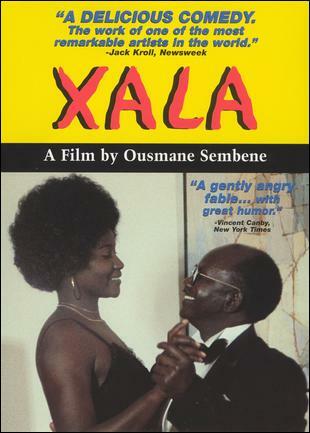 The title of the film, “Xala,” is Wolof for impotence. Like its main character’s eponymous affliction, Xala’s narrative, plot-devices, and gags are neither subtle nor nuanced, but they also forgo the density and pretentiousness of countless other artsier films about social justice and cultural imperialism, and furthermore the film’s message isn’t heavy-handed because most of its jokes hit. There’s nothing hidden about Xala’s agenda or its characters, and sometimes that’s appropriate in a film, even one so sociopolitically minded as this one. Predictably but again appropriately, the film’s narrative and its protagonist’s arc are the standard “immoral/naive main character learns his lesson the hard way“-archetype. Leye’s final confrontation with those he’s wronged in the past and the revelation of the origin of his affliction feature a disgusting form of retribution, but nothing here comes across exploitative or gratuitous. As with most every low-budget African film I’ve seen, Xala’s main barrier to outsider (i.e. non-African) viewers is its production restrictions and nondescript camerawork. The main strengths of the film are its character traits and narrative message, and in those respects, Sembene’s film is a success. However, don’t go into this expecting a particularly flashy or well groomed directorial work. This is rough, gruff, to-the-point Sub-Saharan cinema. Leye (left) speaks to his character’s daughter, Rama (right), while the ever symbolic imported French bottled water divides them. SUMMARY & RECOMMENDATION: Thierno Leye’s boorish, greedy fool of a character leads the story with a distinct arc and heavy learning curve. He gets his just deserts and it’s fun watching him learn his lesson — except in the last scene. Xala’s themes of corruption, post-colonialism, and sexist double standards are well parodied without ever becoming preachy. — However… Xala looks and feels cheaply made, which it was. Cinematographically speaking, the film is neither eye-catching nor inventive.